We’re pleased to announce that we now have a new date for the Aidan Robson talk that we had to cancel due to the snow. Aidan will be back in Dundee on Wednesday 24thApril 6pm at Dundee Science Centre. In 1964, Edinburgh physicist Peter Higgs predicted the existence of a new fundamental building block of our Universe: the Higgs boson. In 2012, with the aid of the biggest scientific instrument ever built, the Large Hadron Collider, a new particle thought to be the boson was observed to great international acclaim. 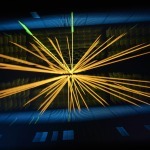 Come along and hear first hand from one of the physicists who played a vital role in the experiments which led to the identification of the Higgs boson. This talk by Dr Aidan Robson, physicist at Glasgow University, will explain the science and significance of the recent discovery. Join us at our regular venue, the delightful Infusion coffee shop, inside Dundee Science Centre. Doors open at 5.00pm when the coffee shop will be serving drinks and snacks.